Geodetic Mark Coordinate Update - 1 December 2018. The 2016 Kaikoura earthquake resulted in significant land movements across much of New Zealand. The majority of this movement was accounted for in a January 2018 update to Landonline and the Geodetic Database. After the January update, more geodetic data became available which enabled LINZ to improve the modelling of this earthquake. This meant that geodetic coordinates and their orders could be calculated more accurately. 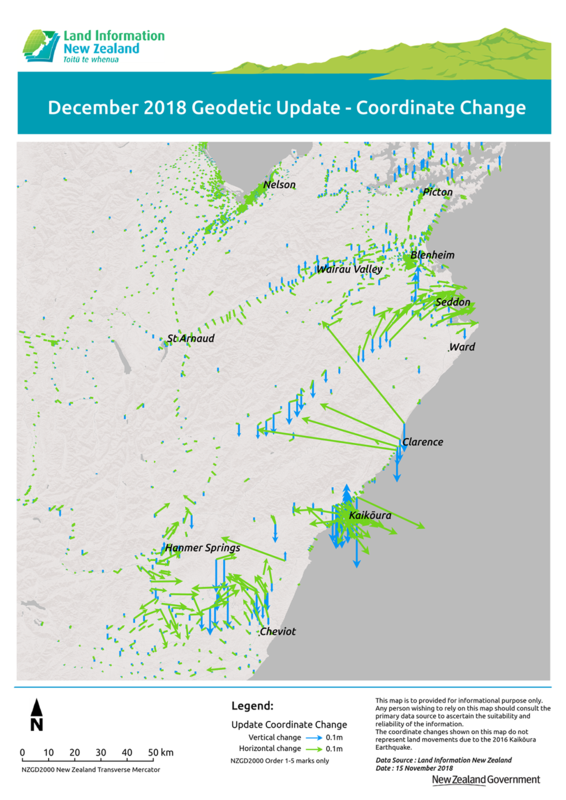 New geodetic data from surveys undertaken since the January 2018 update have been incorporated into the National Geodetic Adjustment (NGA), and used to improve the accuracy of geodetic coordinates throughout New Zealand. In addition, a significant amount of historic trig and survey control traverse data was added to the NGA since the last update. As a result a few hundred 7-12 Order NZGD2000 1V benchmarks were upgraded to NZGD2000 Order 6. The update improved the accuracy of coordinates in terms of New Zealand Geodetic Datum 2000, New Zealand Vertical Datum 2016 and some local vertical datums. Nationwide, the coordinate changes were generally small: for example, 98% of Order 5 and better marks have horizontal coordinate changes less than 2cm. The primary purpose of this update was the continued recovery from the 2016 Kaikoura earthquake. The majority of this movement was accounted for in a January 2018 update to Landonline and the Geodetic Database. However, since the January 2018 update geodetic data was collected and analysed. This meant that geodetic coordinates and their orders can be calculated and/or modelled more accurately. The map below shows the north-eastern region of the South Island, the area most impacted by the earthquake. The coordinate changes represent improvements to the original earthquake deformation model with the addition of the new data, not post-seismic deformation since the last update. Due to uncertainties in the models within the earthquake area, some high order NZGD2000 geodetic marks were downgraded to less than Order 6. Also some high order NZVD2016 marks were downgraded to less than 3V. Cadastral coordinates were not changed by this update. However, as there were some significant coordinate changes in the earthquake affected area, cadastral marks in Kaikoura and a few other small urban areas will be updated early in 2019. Until this cadastral update, some cadastral marks may not be in terms with nearby geodetic control. The 2016 Kaikoura earthquake resulted in significant vertical movement in much of the north part of the South Island and lower part of the North Island. As such the local vertical datums in these areas were updated with a vertical deformation patch in January 2018. There has now been additional refinement of the vertical deformation model and a subsequent patch applied by this update. 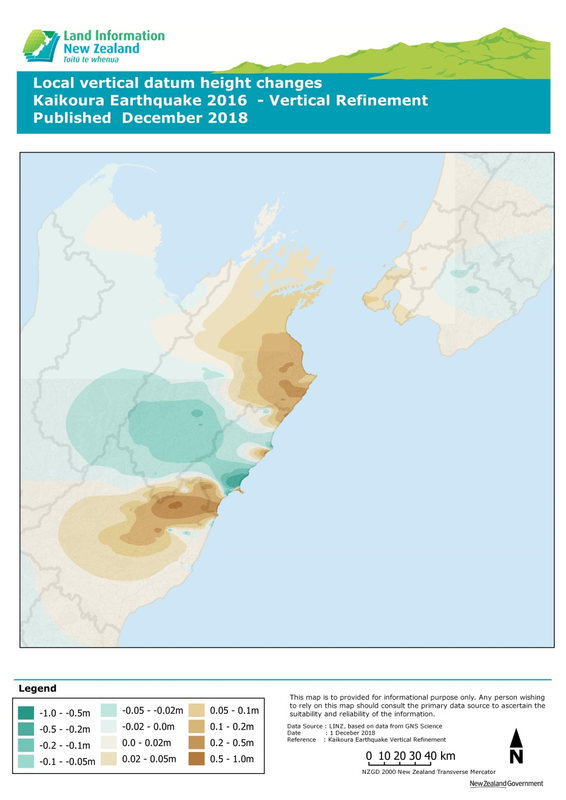 As a result, LVD heights across Wellington, Marlborough and North Canterbury have been impacted. The largest vertical changes, near the fault lines, are more than 50cm. However, 87% of LVD 3V or better marks had a height change of less than 5cm. Previous coordinates for a geodetic mark are still be available in the Geodetic Database by selecting the “Historical values” link for that mark on the “Mark details” page. In this update there is a new coordinate entry for every geodetic mark whether or not the coordinate value changed. A coordinate is either “Updated”, “Verified”, or “Not tested” in the NGA. Not tested in National Geodetic Adjustment. *A lower threshold has been selected for LVD Order 1V and 2V as this better reflects the accuracy of the vertical deformation model used to update the LVD heights. In the earthquake affected areas some marks may have a 3d NZGD2000 coordinate, but the reference may indicate that the height only or the horizontal position only is being updated or verified. However it may also be apparent that the other component was also changed by the update. This happened only in the Kaikoura earthquake area where the NGA has only vertical or only horizontal observations to the mark. The other component is not calculated, it is being updated by the reverse patch. This has not been described in the reference due to database size limits. An example of this is EH2B. In addition, a new feature of the coordinate reference is that it now records the date, either year, or both month and year, of the latest observation used in the NGA to calculate the coordinate. All marks in the NGA were rigorously tested for accuracy, both relative and absolute, and orders assigned. Most mark orders remain unchanged. In all areas not affected by the Kaikoura earthquake, coordinate orders may have been upgraded or downgraded, however, no high order NZGD2000 coordinates were being downgraded to less than Order 6 NZGD2000. In the Kaikoura earthquake affected area, coordinate orders may have been upgraded or downgraded. Some high order NZGD2000 coordinate were downgraded to less than order 6 NZGD2000. In some cases the order may have been changed to reflect the accuracy of the coordinate, even though the coordinate itself is not changed. In the Kaikoura earthquake affected area, if a survey mark is downgraded to less than order 6 NZGD2000 then a cadastral survey connected to that mark may no longer comply with rule 4.2 (Horizontal datum - connection) of the Rules for Cadastral Survey 2010 (RCS 2010). the field work for a survey has been completed as if it complied with rule 4.2 but it became non-compliant because of the coordinate update and the CSD had not been lodged prior to 2 December 2018, the surveyor may seek a dispensation from rule 4.2 prior to lodging the CSD. The dispensation should be requested using the Landonline e-request type “survey_dispensation’’. The Surveyor-General will consider each case on its merits. In the Kaikoura earthquake affected area, if the reduced level of a vertical control mark (order 3V or better in terms of an official vertical datum) changes, or the order drops below 3V, then a cadastral survey connected to that mark may no longer comply with rule 4.3(a) RCS 2010.
is lodged after 2 December 2018, reduced levels must be in terms of updated values and vertical order. E-survey users may need to refresh their Landonline workspace after the update. The actions listed below may be required for each CSD in your Landonline workspace on 3 December, that is within an affected area, and that also contains any captured marks and vectors. Any CSD that only contains plan graphics, such as Flat Plans and Unit Plans with no survey sheets, will not be affected and you will not need to perform this procedure for them. The following actions also need to be applied to any CSD within an affected area that you submitted before 3 December and is returned to you on requisition. Open the spatial window by selecting ‘Search|Spatial View’. Refresh the spatial window by selecting ‘Capture|Refresh’. In Plan Generation select ‘Generate Plan|Layout Plan Sheets’, check the plans for correctness and select the ‘Complete’ button. This will regenerate the CSD in terms of the new coordinate values. Re-run prevalidation and check for any new conflicts or warnings (see below for information about C440 failures). If you do not complete this procedure, you may get error message 124210: ‘There was an error updating the geometry for Parcel XXXXXXX’ when running ‘Prevalidation’. You should then follow the procedure above.